Kate Slevin, William and Mary’s chancellor professor of sociology, has been named the recipient of the college’s 2007 Thomas Jefferson Award. The award is presented each year to a faculty member for significant service through his or her personal activities, influence and leadership. Slevin will be presented the award at the Charter Day ceremony here today. Slevin began working at William and Mary in 1986 as the Associate Provost for Academic Affairs. She joined the sociology department in 1990 as an associate professor and director of its graduate program and, from 1997-2003, served as the department’s chair. Her research, which highlights age as a core site of social inequality, has received national praise. She has published several journal articles, book chapters and three books. Beyond her research pursuits, Slevin is a dedicated educator and a tireless advocate for women and minorities on the campus. She has been a supporter of the Women’s Network (formerly the Women’s Caucus) since her arrival at the College, twice serving as its co-coordinator. She also served on the President’s Campus Committee on Diversity, led focus groups to identify problems minority students face on campus and served on the sub-committee that created the College’s new diversity statement. Slevin helped set up the current freshman-sophomore advising program and served on various committees at the College. Her efforts have earned her numerous honors throughout her career, including the 2004 - 2005 Phi Beta Kappa Award for Excellence in Teaching, the Outstanding Women in Government Award, the Distinguished Educator Award and the State Council for Higher Education Outstanding Faculty Award in 2005. Slevin received her undergraduate degree from University College in Dublin, Ireland. 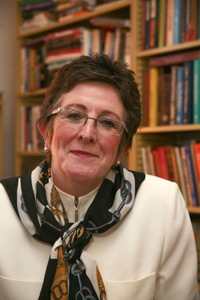 After earning her master’s and Ph.D. degrees from the University of Georgia, she began her career in higher education in 1975 as an assistant professor at the University of Richmond. In 1981, she became the associate coordinator of SCHEV and served in that position until she began working at William and Mary in 1986.